The Baden Storytellers’ Guild began in 1989 as one of the services offered by The Story Barn in Baden. It was a direct response to interest expressed by participants in workshops offered by Mary-Eileen McClear, the Founder and Director of The Story Barn. While the initial goal was to have a time and place to hone storytelling skills, the Guild soon began to accept and seek out engagements which would take storytelling into the Community. In 2012 local regulations made it no longer feasible to keep The Story Barn going as a public venue. Luckily the Waterloo Community Arts Centre, a.k.a. 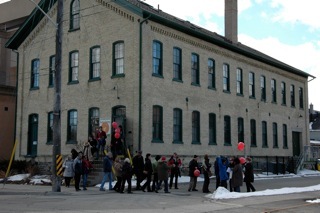 Button Factory Arts, in Waterloo, offered us a wonderful home under its roof. Now we start an exciting new chapter in which old traditions continue and new collaborations begin. Come join us!